Curry leaves (கறிவேப்பிலை) are used in our cooking everyday mainly for seasoning, though they can be used to make chutney, kuzhambu and powder. They are rich in iron, calcium, folic acid and vitamin A, and are said to have medicinal properties. 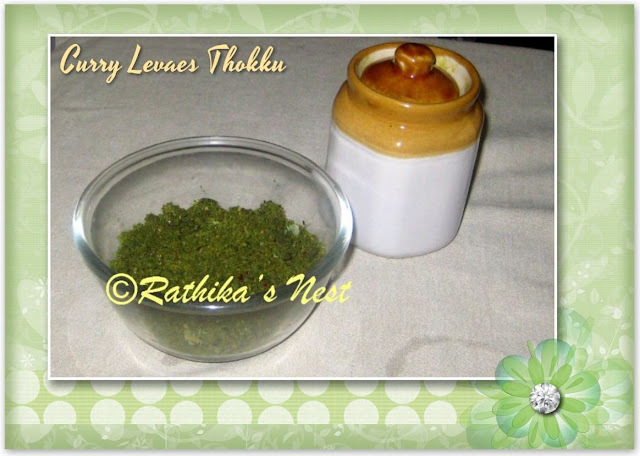 Curry leaves thokku (கறிவேப்பிலை தொக்கு) is a simple recipe that can substitute pickles in your meal. Method: Wash the curry leaves in running water and drain fully. Heat oil in a kadai, and add red chilies. Fry till they turn dark red in colour. Now add urad dhal and Bengal gram dhal, and fry till the dhals turn light brown in colour. Switch off the stove, add the curry leaves to the hot kadai and mix well with other ingredients. Allow the fried ingredients to cool. 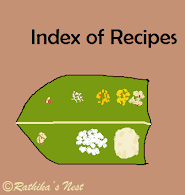 Later grind all the ingredients with tamarind and required salt into a medium coarse powder using the mixer grinder. Do not add water while grinding. You can keep the thokku refrigerated for at least 1–2 weeks. Curry leaves thokku goes well with curd rice and dosas.